Plan Your Strategy Comprehensively. No, you don’t have to create a content marketing plan that covers your bases until 2018. You do, however, need to give yourself some kind of structure and idea of the kind of content you’re going to post, and when. If you do this, your content will feel targeted and focused to your customers, instead of scattered and random. In the content marketing world, consistency is key. Post Frequently. Whether it’s social media, a blog post, or even a tweet, one of the biggest keys to effective content marketing is frequency. If your clients aren’t seeing anything new from your business, one of two things could happen. One, they could assume that your business isn’t engaged with their customers. Two (and this one is more likely), they’ll forget about you. When you’re trying to grow your business, the goal is to stay at the forefront of everyone’s mind — and that includes both current clients and potential ones. Get To Know Your Customers. eEndorsements gives clients the opportunity to interact with and observe data from their review archives. Treat that information seriously, as getting to your customers is crucial to continuing to grow your business. Understanding what customers felt was lacking, what they loved, and concerns they might have is paramount. 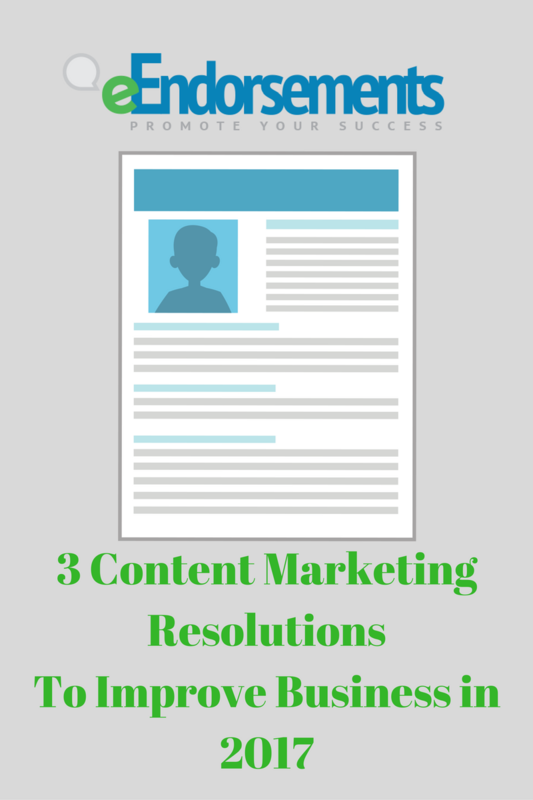 2017 has just begun, which means every growing business has the opportunity to stick to these content marketing resolutions. Try them and watch your business grow and prosper all year long.